A tendon is a strong cord which joins a muscle to a bone. It enables the bone to move when the muscle contracts. Your Achilles tendon joins the bottom of your calf muscle to your heel, at the back of your ankle. It enables you to point your foot down and raise your heel. 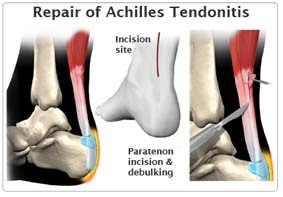 In this case, your Achilles tendon is torn - or ruptured. This typically occurs in men in their forties or fifties whilst playing sports such as squash or badminton. Without treatment you will never be able to bend your foot down with any strength. You would then find going up-stairs difficult. You would be unable to stand on tip-toes. You will have a general anaesthetic, and will be asleep for the whole operation. A vertical cut is made down the back of your heel. The ends of your ruptured tendon are brought together. They are then held together with stitches to help your tendon to heal. The skin wound is then closed up with stitches. You will be in hospital three to four days after your operation.You can go home when you can walk safely with crutches. You will be in a plaster for approximately six weeks. If you come to the hospital within 24 hours of your injury you can be treated in a plaster cast without an operation. You are put in a plaster with your foot pointing down (like a ballet dancer). This relaxes the tendon and allows it to heal. If you are not seen straight after rupturing your tendon you will probably need to have an operation on your ruptured tendon. You will have come to the hospital as an emergency. You need to let the doctors and nurses know about your general health, past illnesses, and drug treatment. Arrangements will be made for you to have the operation within 24 hours or so of the injury. You will have all the necessary tests to make sure that you are well prepared and that you can have the operation as safely as possible. Your leg will be in a plaster cast from your knee to your toes. Your foot will be pointing down to relax your newly repaired tendon. Your heel may be painful. You will be given injections and later tablets to control this. Do not press on the plaster for 48 hours. Ask for more painkillers if the pain is getting worse. A general anaesthetic will make you slow, clumsy and forgetful for about 24 hours. The nurses will help you with everything you need until you are able to do things for yourself. Do not make important decisions during this time. Your plaster will be changed and your stitches will be removed 10 to 12 days after your operation. Do not get your plaster cast wet. Most hospitals arrange an appointment at the orthopaedic outpatient department 10 days or so after your operation. The nurses will advise about sick notes, certificates etc. your toes become very swollen or if you have severe pain. If you are experiencing one or more of these it could be an indication of a problem with the nerves or the blood vessels in or around the area of surgery or of an infection. In this case you should return to the hospital urgently. Come back to see the plaster technician if the plaster cracks or is getting loose. Physiotherapy will be arranged once the plaster is removed. You will not be able to drive for up to two months after you leave hospital. You will not be able to perform an emergency stop as quickly as normal before then. How soon you can return to work depends on your job. If you mainly sit at work, you may be able to return to work three weeks after the operation. This also depends on you being able to get to work. If your job involves a lot of walking, you will be unable to work for two or three months. You may swim gently as soon as the plaster cast has been removed. You may begin to play most sports when you are able to stand on tip-toe. When you re-start sport, you will not be able to play for as long as normal. Your ankle will ache at the end of a game. As with any operation under general anaesthetic there is a very small risk of complications related to your heart or your lungs. The tests that you will have before the operation will make sure that you can have the operation in the safest possible way and will bring the risk for such complications very close to zero. Wound infection sometimes happens. You will be given antibiotics to prevent this. More serious complications like damage to the blood vessels or the nerves in or around the area of the operation happen rarely and you might need another operation to fix them. Occasionally (in about 3 out of a 100 cases) the tendon ruptures again. If this occurs you will need another operation.